It takes a lot to impress me hostel wise these days! After 4 years bouncing around the globe and having spent the vast majority of that time living in hostels I’ve got some pretty high standards for what I need from a solid stay in a hostel. But when I checked into Mad Monkey Hostel in Siem Reap, Cambodia I was instantly impressed. Poolside bar, $1 beers and fast wifi…and I hadn’t even checked in yet! The View From The Rooftop Bar! Mad Monkey is a chain of hostels throughout Cambodia with bases in Siem Reap, Phnom Pehn, Kampot and their most recent one on Koh Rong Samloem and I’ll be honest I’m always slightly wary about staying in chain hostels – in my past experience they’ve always fallen a bit short on the experience of smaller, locally owned places. 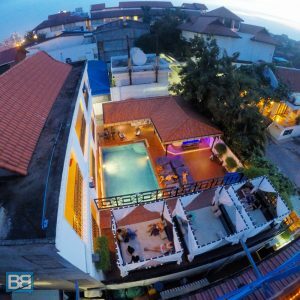 On The flip side Mad Monkey was super social from the off, with the pool providing the epicentre of the daytime social scene and the rooftop bar setting up the antics after dark – all fuelled by super friendly staff from both the international and Cambodian scene. To say Mad Monkey Siem Reap ticked all the boxes as far as facilities went is a bit of an understatement! With A/C, en suite rooms, a pool to cool off with during the day (including a poolside bar) wifi throughout (although admittedly not so great in the rooms), king size single beds, tour and transport booking service and even their own fleet of Mad Monkey tuk tuk drivers to get you from A to B! We used a dude called Tom throughout our stay – including our day trip to Angkor Wat – and he was a total legend, so ask for him when you’re there! Rooftop Bar, Beer Pong and Sand Floor…EPIC! The icing on the cake though facilities wise was the rooftop bar – which played host to some epic sunsets and of course some intoxicated chaos! Sunset With A Cold One! It’s the social hub of Mad Monkey in the evenings and serves up some incredible food throughout the day – both Western, Cambodia and I also highly recommend the Mexican! Did I also mention the main part of it has a sand floor too?! Kick of your flip flops and go barefoot rooftop bar style! When the sunsets though is when it comes into its own, with beer pong tournaments getting everyone mingling. There are also nightly events too which range from traffic light parties to free keg nights – so even if you’re travelling solo it’s not going to be difficult to get involved and meet heaps of new buddies. …despite the picture I might have painted as this being a party hostel to be honest yo can avoid it pretty easily and still get a good nights sleep if you’re not drinking – which especially handy when you’re getting up at 4am to catch sunrise at Angkor Wat! And even if you do wake up slightly worse for wear the combination of an amazing breakfast (the eggs benny with spinach was my brekkie of choice!) and refreshing pool will soon bring you back to life! Overall Mad Monkey Siem Reap provided a solid nights sleep and heaps of added extras and is somewhere I wouldn’t hesitate to recommend. 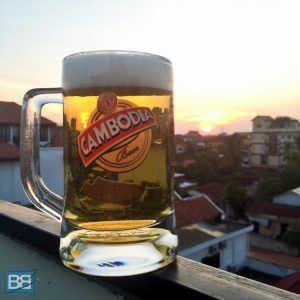 Although it wasn’t my cheapest accommodation in Cambodia (check out my How Much To Budget For A Month In Cambodia post for more info on that) it was my favourite by far. In fact I loved it so much that it has easily made it into my list of my favourite hostels worldwide! 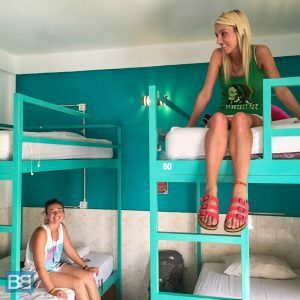 If you love the sound of staying at Mad Monkey they also run and epic 12 days tour through all of their hostels called the Cambodia Monkey Ladder which is worth checking out! Have you stayed at any Mad Monkey Hostels in Cambodia? Sounds fantastic! I think I read about Mad Monkey last time you blogged about them & I made it my mission to hit up Cambodia just to stay at one of their wonderful abodes. Although it guts me to not be able to make it to Cambodia on this trip, I’m willing to bet I’ll be there sometime in the future! From all your instas it looks like you’re having a great stay. Indeed loving Cambodia and the MM hostels have been awesome! Hopefully you’ll make it there soon! I just finished off the Kampot tour too actually and it was heaps of fun! Looking forward to crossing paths with you in Vietnam next week!